Who's your Daddy? It better be the Gene Larew HooDaddy because these baits are in total control of the waterways. The 6" HooDaddy is the granddaddy of creature baits and earned Darrel Robertson hundreds of thousands of dollars in a single tournament before it was even introduced to the public. 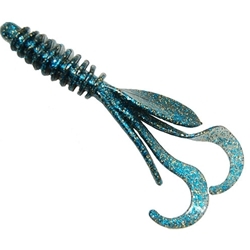 This 6" HooDaddy is considered the hottest "money bait" on the bass tournament trail and comes 8 count per bag. The 4.5" HooDaddy Jr. is not too big, not too small, just the right size! 10 count per bag. The 3" Baby HooDaddy is the tiny version that catches everything from crappie to smallmouth and comes 15 per bag.